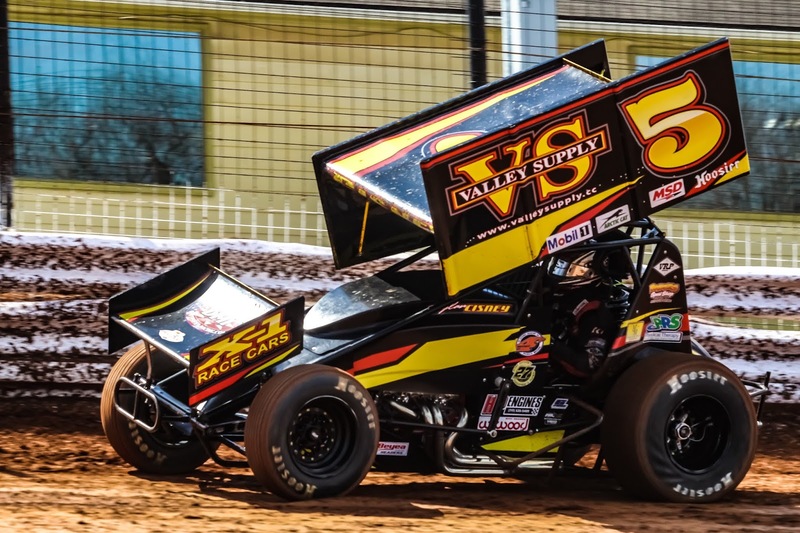 PORT ROYAL, PA – Dylan Cisney raced by Anthony Macri off the fourth corner on the final lap stealing the Opening Day Sprint car win Saturday afternoon at Port Royal Speedway. In other action, Jason Covert won the United Late Model Series (ULMS) feature with a late-race pass and Andrew Yoder dominated the Mason Dixon Shootout Series for the limited late models. The win for Port Royal’s own Cisney was worth $4,000. It was his first win since 2014. “I lost so many races the last couple years here on a last lap pass it’s good to be on the other side for once,” Cisney said. “Our goal is to race around a little bit more this year,” he said. “We’ve got to get better. We don’t do enough racing and our goal is going to be to get to more tracks and get more laps under our belt. Macri has been a factor in almost every race so far this season, but hasn’t been to victory lane yet. Macri’s lead was 2.6 seconds as Brock Zearfoss and Bowser raced hard for second. Zearfoss slipped a little high off turn two allowing Cisney to drive by on lap eight. Cisney got by Bowser for second on the frontstretch, but Bowser returned the pass in turn two. Cisney finally made the pass stick a few laps later. 21st starter Logan Wagner, Carl Bowser, Mike Wagner and TJ Stutts rounded out the top 10. In the 30-lap River Valley Builders ULMS feature, Dylan Yoder started on the pole driving into the lead. Max Blair raced into second with a pass of Gene Knaub. Yoder controlled the restart as Jason Covert passed Rick Eckert and then Knaub taking over third. Covert went after Blair taking second on lap 12. The yellow flag flew, however, negating that pass. A wild restart saw Covert, Eckert and Knaub all pass Blair as Yoder maintained control. He led by 1.884 at the half-way point. Yoder was working through lapped traffic without much trouble over the final 10 laps. Eckert challenged Covert for the runner-up spot as Yoder led by 1.383 with five laps to go. Yoder was on the bottom, but blocked by slower traffic. Covert went to the middle groove and made it work taking the lead off turn two with less than two laps left. Covert, of York Haven, scored the win by 1.114 over Yoder. Eckert, Rine and Blair completed the top five. Michael Norris, Gene Knaub, Michael Maresca, Austin Hubbard and Tyler Bare rounded out the top 10. In qualifying, Eckert was fastest in Group A with a lap of 20.469 and Hubbard fastest in Group B with a 20.794. Heat races for the 36 cars were won by Eckert, Michael Norris, Hubbard, and Knaub. Mike Lupfer and Alex Ferree won the B-mains. In the Mason Dixon feature, Selinsgrove’s Andrew Yoder started on the pole and drove into the lead. As he controlled the pace, Devin Frey and Devin Hart raced side-by-side for second. Yoder’s big lead was erased with nine laps to go when a car broke right in front of him in turn three. He was able to miss the slowing car as the yellow flag flew. Sprint Car Feature (25 laps): Sprint Car Feature (25 laps): 1. Dylan Cisney. 2. Anthony Macri. 3. Brock Zearfoss. 4. Steve Buckwalter. 5. Cale Conley. 6. Lucas Wolfe. 7. Logan Wagner. 8. Carl Bowser. 9. Mike Wagner. 10. TJ Stutts. 11. Ryan Smith. 12. Ryan Taylor. 13. AJ Flick. 14. Blane Heimbach. 15. Jason Shultz. 16. Tyler Reeser. 17. George Hobaugh. 18. John Garvin. 19. Rick Lafferty. 20. Justin Whittall. 21. Jared Esh. 22. Brent Shearer.